Grind it just how you like it. This ceramic burr coffee grinder helps you get the just-right coarseness of ground coffee, depending on your coffee maker (and taste). There are 15 grind settings and it’s made from stainless steel with a ceramic burr that won’t dull or rust over time. Dimensions: 3.25" x 3.25" x 6.75"
Makes an "Amazing" pepper grinder!! We have a percolator that requires coarse ground coffee. Now we can have the perfect cup of coffee. Both tools are well-made and impressed us with how well they worked. 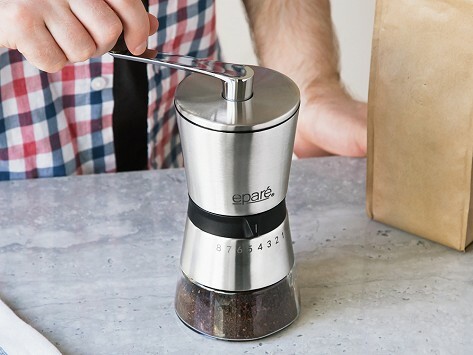 They are easy additions to your coffee-making routine that make any cup a bit more special.